Once upon a time, retail was a fairly predictable and boring business. You could open a store selling general merchandise and, as long as you didn't mind earning paper thin margins and working long hours, you could earn predictable (albeit modest) profits. Fast forward to 2015: technology, increased competition from multi-national competitors, and rapidly changing consumer tastes have made the retail business anything but predictable. Today's retailers need to be flexible and creative, but success is still possible. Here are three rules every new retail chain should follow. The days of the neighborhood general store are dead. With big box stores like Walmart selling an enormous selection of general merchandise, at unbeatable prices, smaller retailers need a niche. A niche is a focused portion of the retail market; retailers who develop a niche are though to have expertise and selection in that area, which entices customers to visit the stores of those retailers. A focused niche is one reason why specialty retailers, like Tiffany & Co. and Tractor Supply Co., have been so successful. Since both businesses have specialized on such a specific product line for so long, they've each built a reputation as the distinct authority when it comes to their respective category of products. Customers expect to find the best diamonds and the best diamond experts at Tiffany because Tiffany has specialized solely on that market for ages. If Tiffany decided to design and sell handbags, hats, and mittens as well, the allure of its "blue box" might not be as strong. While great customer experiences aren't all the same--a visit Starbucks is obviously different than a visit to The Container Store--they always start with a friendly and knowledgeable staff. The staff at Starbucks and The Container Store has a level of expertise above that of their competitors, either in cappuccino or storage products in this case, and that makes a huge difference. The knowledgeable staff at Starbucks helps bolster the coffee house experience as much as the mellow music and comfy chairs do. The tricky part comes in recruiting the talented, engaged, and loyal employees that will create a great store experience. Both Starbucks and The Container Store pay their employees much better than average, and they offer tremendous perks, which often runs at odds with investors and may be challenging for smaller retailers. Retailers who have a halo effect, because they seem purpose filled and morally sound, may also attract better talent. While both Starbucks and The Container Store fit into all of these categories, a smaller retailer might be able to attract good employees if it has an interesting niche and a purpose (which is easier than simply paying more). Yes, brick-and-mortar retailers can still do very well in our current age of e-commerce, but that doesn't mean they can ignore it altogether. At the very least, new retailers need to be aware of the competition that online retailers present. For example, a seller of books, cell phones, or some other item that lends itself well to online shopping, might want to avoid a brick-and-mortar store presence. Online retailers don't have the overhead costs that retail stores do, so they will always beat brick-and-mortar stores in price wars when it comes to selling commoditized products. Specializing in a product that customers prefer to buy in-store, carving out a niche, and having a great customer experience is how a retailer can convince customers to keep coming back (live and in-person). Brick-and-mortar retailers should also sell merchandise online, as well as in store. An Omnichannel platform-selling goods in-store, direct to the customer, and online--should be the goal of any retailer. At Walmart, for example, you can buy merchandise online, in the store, or you can purchase it online and pick it up in the store. Savvy retailers are investing heavily in the logistics between e-commerce and store presence, to allow customers to buy products through any venue they prefer. Having an online store presence can be very expensive, between website related costs, shipping, and storage, which is another reason that selling general items en masse is better left to Walmart. For most retailers, it is a far better idea to develop a niche specialty, selling a high margin product (like a Tiffany diamond) because the infrastructure costs are lower and the payoff is worth the investment. Sure, the odds are stacked against retailers in today's competitive landscape, but still, many successful retailers emerge each year. As an investor, you can cherry pick the stocks of retailers that have the best qualities, or buy a group of them through an ETF to limit your risk. 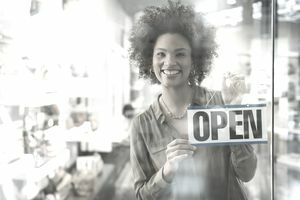 While you may never start a retail chain of your own, you should seek out the businesses that exhibit these traits when deciding which retail stocks to purchase. Disclosure: I do not own shares in any of the stocks mentioned nor do I intend to buy any over the next 72 hours. Never buy or sell any stock based solely on what you read here (or anywhere else). Always do your own research.